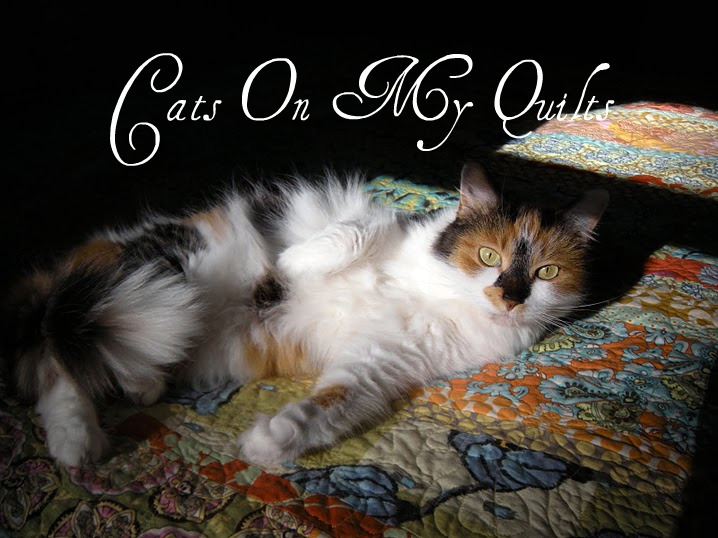 Cats On My Quilts: Where Has Chris Been? Well, I've been right here at home in NH, not somewhere warm which is hard to find in the US I guess. I've also been perfecting the art of coughing myself to death. I had three weeks off from work (I work at a college) and I was really looking forward to the week after the holidays so I could get a lot of sewing done before I went back to work but the creeping crud, as my Mom used to call it, came to visit. The cough has yet to leave. Anyways, I did manage to get some of my snowball blocks done and one lonely row sewn togethter. Now that I am back to work sewing time is hard to find. Hopefully this weekend I'll get going on it. I think I'll be adding borders to make it a bit bigger or I may just make some more blocks to make it bigger but probably not that option. The thought of making a bunch more HST's makes me think twice about that. I think the deadline for this challenge is the end of this month and I may not make it but who cares. I want to get this quilt just the way I want it and that may take a bit longer. I don't like rushing just for a deadline-sewing should be fun. So I hope you are finding some sun and warmth. It actually was sunny and in the 30's today and it felt heavenly! Now this is a lovely quilt.. I can't wait to see it finished. You take your time! You're a lot farther along than I am, it's looking gorgeous! So sorry you've had the creeping crud. Why does that always seem to happen when we are on vacation? Your snowball top is looking good. Seems to me you are way ahead of schedule....Christmas is 11 months away. Your snowball looks wonderful! Love it! Feel better soon! I have hardly been outside all week - trapped upstairs *s* I hear it's warm-ish. Hope you are feeling better soon. Love your header pic! Crud comes, crud goes. 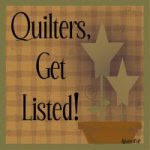 Quilts now, quilts stay! And I'm lovin' your snowballs (my snowballs are still all individual, maybe this weekend?). Today is only the 14th, you have plenty of time...no one said Jan. 2010, and anyway, whos counting? Not me. ps-visiting NH in a couple of weeks...any recommendations on LQS? Love the yellow flowers peeking out in some of your blocks! I hear you Sister. I have been sick since Dec. 28. No cough, but I am still snozzely. Tired of it, I tell you. I hope to get my Snowball rows together today too. Better get cracking! Welcome back..Love the snowball quilt..take care..
Lovely work on the quilt top! You quilt is coming along just fine. I like the reds and white. I agree - deadlines really do manage to kill the fun! Take you time and enjoy every minute. I'm sorry that you've been so sick, but I wanted to tell you that your snowball quilt is amazing! So sorry that you were sick over the holidays. The snowball quilt is looking good and I am with you on not worrying about deadlines. They always take the fun out of things. I'm so sorry to hear you've spent your vacation coughing. No fun at all! But our red and white quilt looks great. Almost finished. You'll be snuggled up in this in no time. That's supposed to be YOUR red and white quilt, not OUR. Sorry for the typo.